Customizable programs offer turn-key faith-centered solutions to the financial challenges that everyone faces ... including your children. Did you know that the Bible has over 2,300 verses about finances and stewardship? With God spending that much time on the topics, it must be a vital test of our faithfulness. Learn how to bridge the gap between God’s principles on finances and what most Christians end up implementing in their lives. 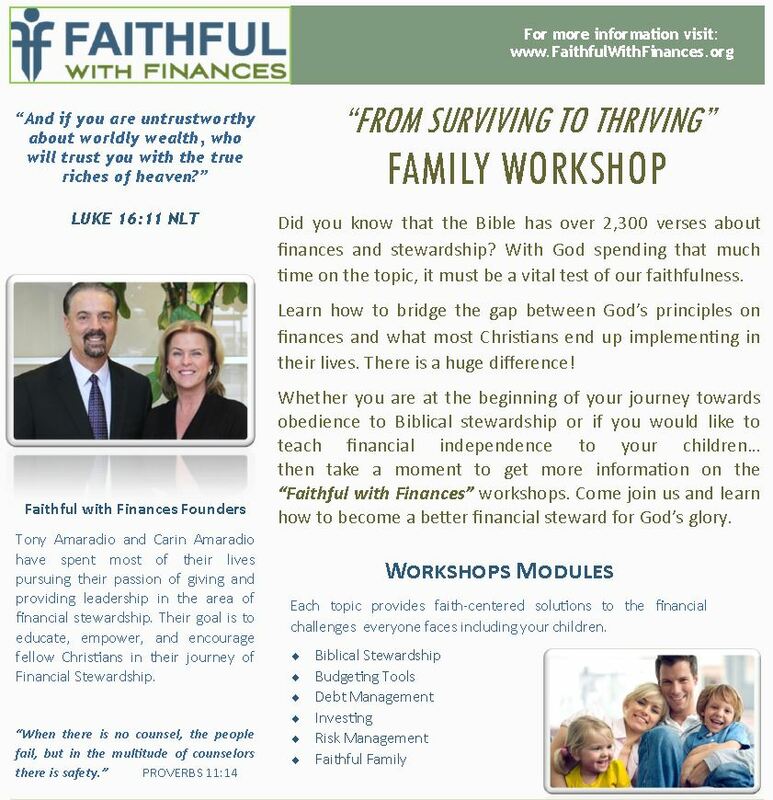 Whether you are at the beginning of your journey towards obedience to Biblical stewardship or if you would simply like to teach financial independence to your children ... take a moment to get more information on the “Faithful with Finances” workshops. The Faithful with Finances program can be customized for all levels providing creative hands-on experiences and activities, and real life situations for your Church, School, or Organization. Contact us today for details on how to bring Faithful with Finances training to your community! Faithful with Finances training can be customized to introduce children to the topic of Getting a Handle on Finances. Our buddy, "The Faithful Farmer", guides the course. As the farmer takes children through the major themes and breaks them down into concepts that are fun, interesting, and truly insightful, they will make the connection between biblical truths and realities about money and dealing with finances. By introducing your children to financial skills early, you enable them to grow into a healthy relationship with money and being a steward of Gods entrusted resources. Children's books featuring "The Faithful Farmer" will be available in September 2018. Faithful with Finances training can be customized for teens and pre-teens to discover the importance of finances in their life. Within the context of circumstances that they can relate to, young adults have the opportunity to learn about being Faithful with Finances. Our training modules provide a practical application of biblical truths and skills that can be practiced to form habits and a healthy concept of money management to last a lifetime. Faithful with Finances for Families - "From Surviving to Thriving"
Workshops are facilitated in Church and Schools to guide families through the topic of Getting a Handle on their Finances. Open up discussion about money and finances and discover practical application, examples, activities, and individual modules designed for each age level. In these workshops families will work together making this course the perfect time to discuss biblical application while learning real skills that will leave a lasting impression on the way that your family looks at resources. Workshops are facilitated in Church and Schools to help adults discover the Biblical connection and direction given on finances. More specifically Getting a Handle on Finances will touch on four core themes: 1) God owns everything, 2) God will provide, 3) the difference between serving and managing money, 4) and stewardship of Gods treasure. The 7 Cornerstones of Faithful with Finances are presented and provide a lasting guideline on facing the challenges of personal finances.